Fewer U.S. commodities shipped overseas for food aid and replaced with more local, regional purchases and cash and vouchers. In his budget proposal, President Barack Obama laid out significant changes in how the United States would fund its food aid. Most notably, the proposal suggests putting a 55% floor on funds to purchase American commodities which the administration said would provide greater flexibility. The reconfiguration comes under the Title II of the Food for Peace (PL 480) program included in the farm bill which is currently administered by the U.S. Agency for International Development (USAID). An administration official explained the proposal would take $1.5 billion and redistribute it into three cash accounts. 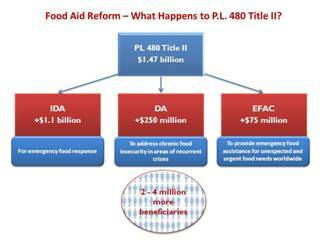 The President is proposing to redistribute $1.5 billion in food aid funding. The official explained that the goal of the changes is to create "greater flexibility" and "get the right kind of food to the area that needs it faster." First $1.1 billion would be transferred to International Disaster Assistance. There is already $300 million in that account available for flexible response to food crisis situations by using local and regional purchases and cash and voucher purchases. The change establishes a 55% floor on funds to still be used to purchase American commodities "which recognizes the central role U.S. commodities have and continue to play in global hunger needs," the official said. A portion of Title II funds historically would be made by monetizing aid – selling U.S. commodities in the region and then using the money to provide the assistance. GAO estimates this costs 25 cents for every $1 generated, which is an "inefficient way" to generate development assistance funds. Instead, funds would go directly to non-governmental organizations (NGOs) and private voluntary organizations (PVOs) to provide the same kind of community development now being utilized. Lastly the change would create a new emergency contingency fund of $75 million to enable emergency food assistance. The official estimates that $500 million in savings, predominantly from the reduction in the amount of shipping costs. The official noted that 3-4 million additional people can be serviced with the change in the emergency food aid and 800,000 more families with the change in how development food aid is administered. "At this time of shrinking budgets and increasing global need, this is an important opportunity to truly be able to do more within the budget constraints," the official said. This will allow the U.S. to continue its global commitment to food aid and be the world's leader in providing a helping hand and doing so with greater effectiveness and efficiency, she added. Many agricultural groups had feared the administration would also change or eliminate the Food for Progress program, however, the President did not make changes. Food for Progress is administered by the U.S. Department of Agriculture Foreign Agricultural Service. The main source of funds is the USDA Commodity Credit Corporation (CCC), which is authorized to provide commodities and up to $40 million each fiscal year to ship those commodities overseas. The President's budget chose not to change the Food for Progress program. Agriculture groups remain opposed to the change of purchasing U.S. commodities. In recent weeks ag groups along with other involved parties sent a letter to the president explaining the importance of the Food for Peace and Food for Progress programs. "Growing, manufacturing, bagging, shipping, and transporting nutritious U.S. food creates jobs and economic activity here at home, provides support for our U.S. Merchant Marine, essential to our national defense sealift capability, and sustains a robust domestic constituency for these programs not easily replicated in alternative foreign aid programs," the letter stated. InterAction, the largest alliance of U.S.-based international NGOs, explained in order to reach more hungry people, food assistance programs must allow for more flexible use of tools such as cash transfers, food vouchers and the local procurement of goods alongside provision of U.S. commodities and direct program funding.